SBI PO Recruitment 2018 Exam Notification. State Bank of India is an Indian multinational, Public Sector banking and financial services company. It is a government-owned corporation with its headquarters in Mumbai, Maharastra. Here is a another Jobs in Banks for job seekers. Every year State Bank of India (SBI) recruited thousands of candidates from allover the country in PO i.e Probationary Officers A large pool of trained and highly skilled Probationary Officers is one of the major assets of SBI and its associates banks. Most of the Probationary Officers recruitment process is done through written test and interview. SBI PO Recruitment 2017 Online Application Form – Total Vacancies – 2313 – Last Date – 6th March 2017. Candidates will be required to register themselves online through Bank’s website www.sbi.co.in/careers or www.statebankofindia.com/careers. After registration candidates are required to pay the requisite application fee through online mode by using debit card/ credit card/Internet Banking. Pre-requisites for Applying Online : Candidates should have valid email ID which should be kept active till the declaration of results. It will help him/her in getting call letter/interview advices etc. by email. 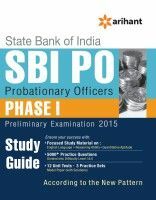 The following qualification is for both SBI P.O and SBI Associate Banks Probationary Officers recruitment exam. Graduation in any discipline from a recognised University or any equivalent qualification recognised as such by the Central Government. Those who are in the Final year/Semester of their Graduation may also apply provisionally subject to the condition that, if called for interview, they will have to produce proof of having passed the graduation examination on or before 01.07.2018. Candidates having integrated dual degree (IDD) certificate should ensure that the date of passing the IDD is on or before 01.07.2018. Candidates possessing qualification of Chartered Accountant may also apply. Not below 21 years and not above 30 years as on 01.04.2018 i.e candidates must have been born not earlier than 02.04.1987 and not later than 01.04.1996 (both days inclusive). Final selection of SBI Probationary Officers in Associates Banks written test will be made on the basis of performance in the online test (PHASE 1) and interview (PHASE 1) taken together. Merely satisfying the eligibility norms does not entitle a candidate to be called for test or Group Discussion (20 marks) & Interview (30 marks). Main Examination will consist of Objective Tests for 200 marks and Descriptive Test for 50 marks. (I) Objective Test: The Objective Test of 3 hours duration consists of 4 sections for total 200 marks. The Objective Test will have separate timing for every section. The candidates are required to qualify in each of the tests by securing passing marks, to be decided by the Bank. (ii) Descriptive Test: The Descriptive Test of 30 minutes duration with 50 marks will be a Test of English Language (Letter Writing & Essay). Penalty for Wrong Answers (Applicable to both – Preliminary and Main examination) There will be penalty for wrong answers marked in the Objective Tests. Each question for which a wrong answer has been given by the candidate, one-fourth of the marks assigned to that question will be deducted as penalty to arrive at corrected score. If a question is left blank, i.e. no answer is marked by the candidate, there will be no penalty for that question. Examination consisting Objective Tests for 200 marks and Descriptive Test for 50 marks. The test will be online objective type, consisting of Four Paper. The questions in objective tests, except for the test of General English,will be bilingual i.e., English & Hindi. Each test will be of 50 marks. Total Marks will be 200. Total Time duration is 2 Hours. There will be negative marks for wrong answers in the Objective tests. 1/4th mark will be deducted for each wrong answer. Candidates will have to pass in each of the objective tests. “Test of English Language (comprehension, short precis, letter writing & essay)”. JbigDeaL will guide you to get SBI PO recruitment written test question papers with answers for Sarkari Naukri Exam, if we found the SBI PO previous year question papers with solution, if you required anything else please comment below. 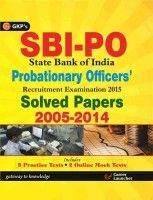 You can also download SBI Probationary Officers Last 10 years question papers with answers. JbigDeaL provides latest SBI PO Exam Model Question Papers 2016 with answers and solution for SBI PO Recruitment written test candidates so that students can make better preparation. We have found some books and study materials of SBI PO Recruitment 2018 written exam test which is showing as following these books are in English and Hindi Language, candidates should have at least one books and also last 10 years sbi PO question papers with solution for better exam preparation. SBI Exam Questions Answers. This mock test having question each, with four choices. On each click on answers system will tell you where the answers is correct or incorrect. There many online practice set of Sarkari Naukri Exam Question answers quiz. Download PO Call Letter for Online Main Exam 21-07-2016 onwards. The candidates should download their call letter and an ‘acquaint yourself booklet’ by entering his/her registration number and password/date of birth, before 15 days for the exam date the bank’s website. The candidates should download their call letter and an “acquaint yourself “booklet by entering their registration number and password / date of birth from the Bank’s website. NO HARD COPY OF THE CALL LETTER / ACQUAINT YOUR SELF BOOKLET WILL BE SENT BY POST. Marks secured by the candidates in the Written Test (out of 250 marks) are converted to out of 75 and marks secured in Group Discussion & Interview (out of 50 marks) are converted to out of 25. The final merit list is arrived at after aggregating converted marks of Written Test and Group Discussion &Interview out of 100 for each category. The selection will be made from the top merit ranked candidates in each category. Results of the candidates who have qualified for GD & Interview and the list of candidates finally selected will be made available on the Bank’s website. Final select list will be published in Employment News/ Rozgar Samachar. Candidates are advised not to forget to mention‘RecruitmentofProbationaryOfficers inStateBank ofIndia-2016’inthesubjectoftheemail.